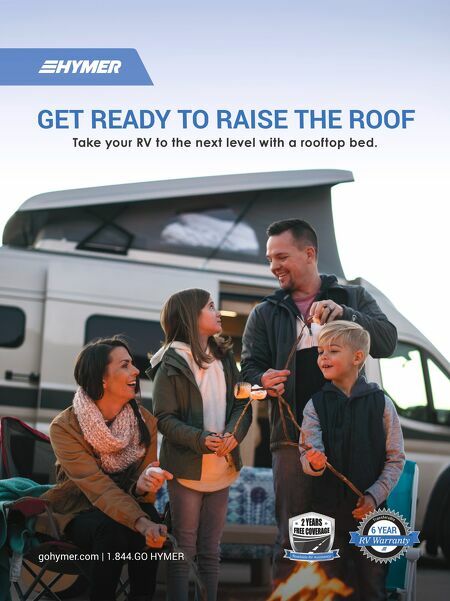 44 • RV PRO • November 2018 rv-pro.com O P E N H O U S E C O V E R A G E Hymer Touring GT Ever since Erwin Hymer Group acquired Roadtrek in 2016, the German RV manufacturer has teased dealers about bringing a sleek, lightweight, European-style travel trailer to the North America market. For Elkhart Open House Week, Hymer's message to dealers was: Mission accomplished – in the form of the Touring GT, which is now available for sale. Hymer Sales Support Specialist Kyle Darrall says the wait to bring the fabled Touring brand to the U.S. seems to have been worthwhile based upon favorable dealer reception to the product during Open House Week. Unlike the European version of the Hymer, which has an aluminum shell, the North American version is built using a composite structure. That – combined with other weight- saving features such as acrylic windows versus glass – gives the nearly 19-foot-long Touring GT a GVWR of just 3,200 pounds, making it a true ultra-lightweight towable by nearly any SUV and lightweight pickup. Notably, the Touring GT features a pop-top roof, which when raised allows for an interior height of 6 feet, 5 inches, helping create a more spacious feel in the coach's 15-foot, 5-inch interior. The eight dual-pane windows (which can be opened wide and which are equipped with day/ night screens included) help bring plenty of light and create an airy feel to the coach, as do the light cream-colored Ultraleather seats and Avonite countertops set against brown vinyl flooring. The Touring GT sleeps four: two in the king-sized rear sleeping area and two in the front of the coach, in a dinette area that converts to a sleeping area. There is plenty of storage space under the king bed, which features a bed platform that lifts for easy access. The all-in-one bathroom includes a shower, a sink, a cassette toilet, a mirror and a built-in vanity. The full galley features a small Norcold refrigerator, a Dometic two-burner propane stove, solid-surface countertops and a sink. A microwave and a TV with antenna are available as options. As with many European trailers, the Touring GT features an abundance of overhead cabinets offering plenty of storage space. LED lighting is located throughout the coach, with dimmable living area lighting. 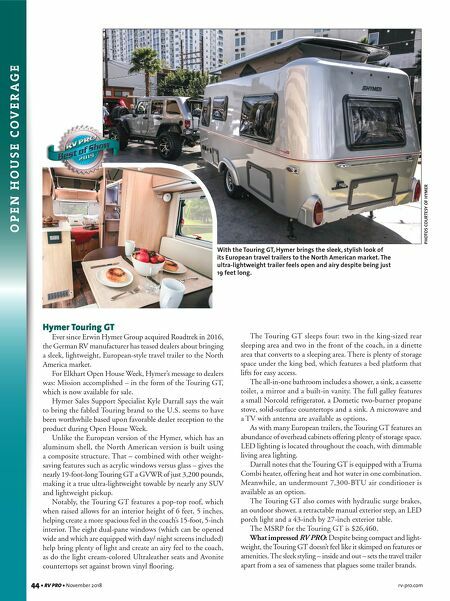 Darrall notes that the Touring GT is equipped with a Truma Combi heater, offering heat and hot water in one combination. Meanwhile, an undermount 7,300-BTU air conditioner is available as an option. The Touring GT also comes with hydraulic surge brakes, an outdoor shower, a retractable manual exterior step, an LED porch light and a 43-inch by 27-inch exterior table. The MSRP for the Touring GT is $26,460. What impressed RV PRO: Despite being compact and light- weight, the Touring GT doesn't feel like it skimped on features or amenities. The sleek styling – inside and out – sets the travel trailer apart from a sea of sameness that plagues some trailer brands. PHOTOS COURTESY OF HYMER With the Touring GT, Hymer brings the sleek, stylish look of its European travel trailers to the North American market. The ultra-lightweight trailer feels open and airy despite being just 19 feet long.